While oil filters remove particulate over 25 microns, sludge, tar, varnish, and wear metals less than 25 microns continue to circulate within the engine and accumulate within the passageways, oil pump and oil pan. These contaminants cause engine wear, higher operating temperatures, and reduced lubrication. Simply pouring chemical flush additives into the crankcase may be ineffective. With this approach, dissolved sludge, particulate and accumulated debris circulate causing significant engine wear. This system cleans your engine by using patented adaptors and specially formulated solutions to dissolve accumulations of sludge, tar, varnish and wear metals. The process is performed with the engine off. Using pulsating pressures, the Bilstein R-2000 Engine Flush System circulates a heated petroleum distillate solution through the crankcase, oil passageways and oil pan to dissolve sludge. A clean engine means better performance, superior fuel economy and longer engine life. 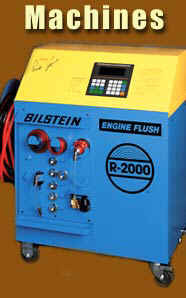 The Bilstein R-2000 Engine Flush will not harm your engine, ring seating, valve guides or seals. All residual oil and cleaning solutions are evacuated leaving a light mineral oil on critical wear surfaces. Tests have shown that periodic sludge removal restores operational efficiencies and reduces harmful exhaust emissions. By reducing wear metals and corrosive contaminants a longer life can be expected. Over the decades, Bilstein has established a solid reputation for quality and reliability. Our products are marketed worldwide only after extensive research and testing.